Friuli is without a doubt one of the most enchanting wine regions in the world, and still one of the least explored in Italy- and a dream come true for wine lovers. White wines are king here and Friuli’s whites have even been coined “Super whites” by wine journalists. Varietals like Tocai Friulano, Pinot Bianco, Pinot Grigio, Malvasia, Picolit, and Ribolla Gialla produce fragrant, elegant and captivating wines here. Some delicious reds are also produced, and the unique red varietals in Friuli such as Schioppetino, Tazzelenghe, Terrano and Refosco, can be blended with Cabernet Sauvignon and Merlot to produce silky and spicy wines. The Friulian wine scene is comprised of real characters, from Josko Gravner, Alvaro Pecorari, the Felluga family and Edi and Renato Keber. The wines here in Friuli can be simply and utterly sublime (think Bastianich, La Viarte, Kante, Lis Neris, Villa Russiz, Borgo San Daniele and so many more). The countryside is splendid, with uplifting landscapes of vineyards, medieval villages and rolling green hills. Ernest Hemingway buffs will also find it interesting that Friuli featured prominently in his books such as A Farewell to Arms where many Friuli locations are mentioned (Caporetto, Piave and Isonzo rivers) and it’s also where the movie starring Rock Hudson was shot. On this sample day excursion to Friuli from Venice (pick up can also be in Trieste or Udine), you will visit two cult estates such as La Viarte and the famed Bastianich estate. Lunch will be at one of our favorite restaurants in Italy-La Subida, a gourmet haunt that attracts foodies from all over the world to this charming corner of the Collio Goriziano wine country. Soak up the delightful surroundings and enjoy the wine tasting today, as a private chauffeur will take care of the driving. Sit back, enjoy the scenery and let us show you this unspoiled part of Italy on a luxury wine tour. 8:30 a.m. Your friendly private chauffeur will meet you in Venice’s Piazzale Roma and will sweep you away to the tranquil Friuli wine country, nestled in the far northeast of Italy close to the Slovenian border. Travel by comfortable Mercedes with beverages on board. 10:30 a.m. You will arrive at the first fine wine Friuli estate of the day, such as La Viarte in Prepotto in the province of Udine. Founded by Giuseppe Ceschin in the early ’70s, a man with a passion and the overwhelming dream of producing fine wine, the vineyards and terraces took years to finish and the first vintage was not until 1984. Today La Viarte is making some of the most fascinating whites in the Colli Orientali del Friuli, along with some incredible reds. His son Giulio is in charge now and determined to excel to an even higher level of excellence. Enjoy a warm welcome at La Viarte and a tour of the vineyards, cellars. Conclude your visit with an extensive tasting of their wines, accompanied by some local specialties. 12:30 p.m. After a tough morning of wine tasting, head to lunch at La Subida- you have a very special treat waiting! 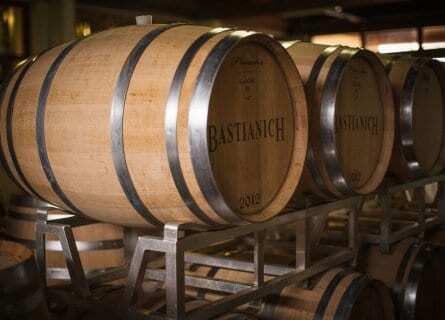 2:30 p.m. After lunch, enjoy a walk around the hamlet and then head to the nearby Bastianich wine estate in Gagliano. Owned by Lidia and Joe Bastianich, American food and wine royalty, the wines of this estate are simply fabulous! Start in the vineyard where you will get an overview of the grape varietals used and their philosophy on winemaking and follow with a tour and tasting of their smashing wines, consistent 3 glass (tre bicchieri) winners. What a great way to finish the day! 4:30-6: 30 PM head back to Venice, where your driver will drop you off in the Piazzale Roma. An unforgettable food and wine tasting experience in Friuli! Excellent organization, timeliness in responding to questions. Everything went flawlessly. Our lunch at Castello Di Trussio Dell’Aquila D’Oro was one of the most memorable dining events we have ever experienced. The building and setting are absolutely exquisite, set on a hillside with beautifully landscaped gardens overlooking the Friuli Region. Felluga-We really enjoyed this wine and having the chance to walk the vineyards and spend time visiting with one of the owers and hearing how they became winemakers. Wonderful wine, a beautiful setting, and we felt like old friends returning for a visit. Vignai da Duline-Lovely location in the old chapel, offering spectacular views of the countryside. The trip was extremely well executed! We will absolutely recommend Cellar Tours.